• Annie Hoog (Anne's mother) was the 1948 U.S.
now an assistant coach at Maryland. works as a professional acrobat/performer. 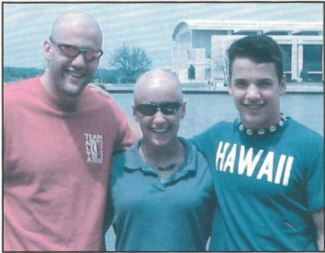 Aaron (left) and Luke (right) visited Talya during her cancer recovery. Chemotherapy made Talya's hair fall out. Love for his sister shaved Aaron's off. Few sports take over your life the way gymnastics can. Fewer still embrace you forever as part of a much larger family. So when Norm Vexler met Anne Burmeister at the University of Massachusetts in 1970, it was almost a given that theirs would be a family of gymnasts. Norm and his brother, Paul, started flipping in the 1960s at Freehold (N.J.) Regional High School. Paul attended Penn State and tied for first on rings at the 1969 NCAAs. Norm competed for UMass from 1967-71 and tied the knot with Anne her sophomore year (1971). Anne's gymnastics roots extend a bit further. Her mother, Annie Hoog, was a member of the New York Turnverein and the alternate to the 1948 U.S. Olympic team. Annie's father would not let her go to London, however. "She was told that she would have to pay her own way," Anne says. "Her father told her that if she was going to represent her country, then her country should pay for the trip." In 1949 Annie was the national Turnverein all-around champion. Two years later she became a mother when her first daughter, Anne, was born in New York City. She later had two more daughters, Barbara and Laura. All three would be gymnasts. "My mom had a town rec program for many years before she opened her gym, so I competed there with Don Wieder as my coach," Anne recalls. Barbara and Laura learned the sport at their mother's gym (Burmeister's) in New Jersey. Anne helped UMass win the AIAW national championships in 1973, the same year she competed at the World University Games in Moscow. It wasn't long before she and Norm had a gymnast of their own. Aaron was born in 1975, a year after the Vexlers opened Hampshire Gymnastics School in Amherst, Mass. Talya arrived in 1980, on Valentine's Day, and finally, Luke in 1985. ''I'm not sure if we [discussed hav- ing gymnast-children], but many of our friends have accused us of creating a master race of gymnasts," Norm jokes. Though the kids had the gym as a second home, their parents allowed them free choice when it came to activities. "We started all of them at a very young age at our gymnastics school in Amherst," Norm says. "It was all fun and play, no pressure." Adds Anne, "We went through the soccer-basketball-ballet stage, but gym was always a part of our family life." Perhaps the Vexlers' no-push parenting kept the gym door open for their kids, as all three fell in love with the sport. "There were many times when the kids were sick and I insisted that they not go to practice, but I always lost that argument," Norm says. "Practice came first over everything." When Aaron worked his way up the ranks and outgrew the family gym, his parents sent him to Tim Daggett's program. From there he went to Temple University. Talya, too, eventually needed more intense training and wound up at CATS in Connecticut under Byron Knox. She went on to compete for Georgia. Luke was the only Vexler to stay at Hampshire until college, and now he's a freshman at Temple. Needless to say, Norm and Anne have been to their share of meets, which meant a lot of chilly gyms and chili dogs. "We have always tried to attend every meet, but that became really difficult for a few years, between Aaron'~ schedule at Temple, Talya as an elite with CATS and Luke competing in the J.O. program," Anne admits. "It was a juggling act ... but as long as one of us was there, it 'counted'." "I think that Anne and I might hold an unofficial record of attending the most gymnastics meets of any parents in the U.s.," Norm says. The most memorable for Anne was the 1994 U.S. championships in Nashville, where both Aaron and Talya competed. "My mom was introduced from the audience as a former Olympic team member, and it was a thrill for my kids to see that Grandmother was actually a famous gymnast," Anne says. "And it was a thrill for my mom to watch them both compete. That was also the last meet my mother saw." THE OLDEST IS ALWAYS the guinea pig, so to speak, so Aaron's involvement with gymnastics became a new experience for his parents, as well. It only seemed natural for Norm to train his son. "I was coached by my father when I was a kid for only about a year or so," Aaron says. "I don't think that it was the best year for us, and I don't think that, for our family, it was the health- iest thing. I really don't understand how anyone can do it. Growing up is hard enough." Talya had a similar experience, when Anne coached her for about a year. "It didn't really work, because we found it so difficult to separate gym and home," Talya says. "Our relationship got to be much better when she stopped coaching me and was just my mom." By the time Luke entered the picture, the Vexlers had learned their lesson. Norm stayed clear of his youngest son's gymnastics education.. "It was hard enough for my parents to get me to clean my room let alone point my toes or keep my arms straight," Luke says. Of course, there is an upside to living in a family of gymnasts. Everyone is well versed in an entirely new language. "Most of my friends in gymnastics hated to discuss gymnastics with their parents," Aaron says. Adds Talya, •"At practice one day, my teammate told me that her mom didn't know what a Tkatchev was. I instantly felt bad for her. My friend is so excited about learning a new skill and her mom doesn't even know what it is or how scary it was to learn." Gymnastics also helped to bridge the generation gap. It kept open at least one channel of communication at a time when kids and parents often have little to say to one another. "When most kids grow up there are a few years there where you have a real tough time with your parents," Aaron says. "With us it was the same, but we always had gymnastics. We always had something that would bring us together to talk about." Norm agrees, and adds that the sport has also helped the kids bond even closer. Gymnastics is a difficult, humbling sport, and one that fosters immense respect among fellow gymnasts. It was only natural that the Vexler kids would grow even tighter as a result. "They were always interested in how the other was doing and always tried to find time to come to each other's meets," he says. "We definitely have a stronger connection than many families I know," Talya says. "One of the ways gymnastics has bonded us is that Luke, Aaron and I have grown up with similar experiences in training, competing, injuries, coaches, etc. We were able to use each other for comfort, inspiration or a friendly kick-in-the-behind." "I think gymnastics helped our kids to like one another that much more," Norm explains. Like most gymnasts, each of the kids wanted to quit at some point. Norm and Anne did the right thing when the subject came up. "I think that when you are a gym owner, you can see what parental pressure does to a child," Aaron says. "[My parents] knew all too well that a little push can all but ruin a child's love for the sport." Aaron recalls the day he was ready to hang up his grips. "I remember being so mad at my mother because I told her that I wanted to quit," he says. "She responded so fast with, 'That's fine, sweetheart. You know that you don't have to do gymnastics. '" Errrrrrgggggg! Aaron had expected a different answer. "I think I was so mad because I did not want to make such a huge choice by myself. I would have rather blamed any choice and its consequences on my parents. I think I ended up quitting for one day." Talya had a similar experience. "I think I wanted to quit when I was 12," she says. "It was right at the point where gymnastics began to be very difficult. It was not all fun all the time. It was training. My parents told me that it was OK to quit, but they thought I should at least finish the competitive season. I think they sensed that I was just going through a difficult phase and things would get better. They were right, and I never thought about stopping after that." As the youngest, Luke had the benefit of watching both siblings go through the various struggles of gymnastics. In that regard, he was more aware of the sport's pitfalls. "Anyone who does gymnastics at a serious level wants to quit at some point," he says. "It's too hard of a sport. I have never felt any pressure from my family to do gymnastics, but I can't imagine my family without everyone as a gymnast. It's sort of a weird feeling." Take family gatherings, for example. They often become an impromptu Cirque du Vexler. "We always have a little What-can-you-still-do? session," Aaron says. "It's the best when my dad can still bust out a roundoff back handspring at 55 years old," Luke says. "Gymnastics has fueled my family with our need to push ourselves to the limits. It shows up whether we are performing, surfing, skiing, doing back flips in the yard or competitive gymnastics." Aaron has an ongoing battle with Norm, who can still do something his son cannot. "My father still has this one move that comes out after awhile at family events," Aaron says. "It kills me because even at my top shape I could never do it. It is called the All American Push-up." (You lie flat on your stomach, arms straight overheard, then raise your body into a hollow position using your fingertips and toes.) "To this day my father can still do it like an animal, no problem." Then there's Norm's gymnastics version of "When we were young we walked a mile to school through a foot of snow .... " He likes to chide his sons about the way things used to be. Says Aaron, "He would always say to me, 'When I was a gymnast you had to hold a crosS" for three seconds, and you could not use a false grip.' And then he would point it out on a picture of himself .... 'That's how you do a cross." The Vexlers, all physical specimens shaped by years in the gym, would eventually greet a most unwelcome guest to their gymnastics family. While completing her marketing degree at Georgia, Talya, an NCAA All-American on balance beam and floor exercise, learned she had breast cancer. She was only 23. It's a day that Norm will never forget. "The three most painful words ever spoken to me occurred on Feb. 25 (2003). It was the end of a cold winter day in Massachusetts. I was sitting in my truck waiting for Talya to call. I knew that she had a doctor's appointment that afternoon to give her the results of the lab test. As I answered my cell phone, I expected Talya to say that the test was negative and there was nothing to worry about. Instead, I could hear her crying on the other end as she said to me, 'Dad, it's cancer.' My whole body went limp. How could this amazing athlete, so young and healthy and solid as steel have cancer? What did I do wrong? I'm 54. It should be me. I didn't stop crying for days." Says Anne, "There is no preparation for cancer. There is no strength program or sets of skills to work on. It is devastating and beyond comprehension. I think we all felt betrayed, as our whole family is into healthy food, exercise, gym, etc. But you cry hard and long and pick yourself up and do what needs to be done." Indeed, the Vexlers - and their always-on-call gymnastics family - kicked in. And let's not forget the fight in Talya, who had learned so well the value of hard work from Norm and Anne and gymnastics. Cancer had rarely faced such a formidable foe. "I can say, without a doubt, that I wouldn't be here today if it were not for my family, extended athletic family at Georgia, and extended gymnastics family all over the United States," says Talya, whose cancer was caught early and stopped by surgery and chemotherapy. "Without the reminders that so many people believed in my ability to fight the cancer, many from people I didn't even know, I don't think I could have found the resolve within myself to get through the treatment." Georgia coach Suzanne Yoculan was instrumental in helping Talya receive the best care in Athens, Ga. She opened her home to Norm and Anne, and her Gym Dawgs started a campaign to raise $100,000 for the breast health center at Athens Regional Hospital. "The University of Alabama, Georgia's biggest rival, even contributed to the fund raising," Talya says. "I have never in my life felt such an outpouring of love for one individual," Norm says. "I'll never forget that. Especially Suzanne Yoculan." "Cancer reminds you that life is precious and can be taken away just like that," Anne says. "But it also shows you how really tough you can be, and how strong you are. Most people never get that opportunity." Two years later, Talya is cancer-free and full of goals. She's an assistant coach at Maryland, and embracing every new challenge of the position. "My ultimate goal is to be a head coach and to have multiple years of success at NCAAs," she says. "I have a lot to learn, though." Given her background, Talya should catch on fast. Aaron has followed a different route, though gymnastics has been his compass. He and former teammate Mike Moran have enjoyed a professional acrobatic career in show business. Their company is called Axiom (www.axiom- act. com), and Aaron's numerous performance credits include appearances on Broadway, MTV, "Good Morning America" and the "David Letterman Show." "My performing has let me see the world, and best of all, introduced me to my wife," Aaron says. "I am really happy to have found something that has brought me the same joy [as gymnastics] in the sense that I am always striving to become a better performer." Luke still has his whole NCAA career in front of him, as well as a trip to the Maccabiah Games this summer. But there's no way he'll ever leave the sport. "I could never see myself going to a 9-to-5 job where I had to do actual paperwork and boring stuff," he says. "I know that I am going to do something that involves performance and pushing myself to the limits." Ask the kids what they've learned from Mom and Dad, and all repeat a similar chorus of "hard work." "I am really, to this day, in awe of my parents and their work ethic," Aaron says. "I try to emulate them as much as possible, but I don't think that I would ever be able to do what they have done. They are really special." Talya says she learned "to always do what is right, not what is expedient. Watching them develop two successful businesses has taught me to always strive for the highest quality work you can possibly produce." Luke's philosophy is more direct: "Whatever you do, do it to the fullest, always try your hardest. Presentation, dedication and honesty are the things that will make you happy and successful." Some kids, those Vexlers. Norm and Anne should feel proud. And though gymnastics has been a constant backdrop, the parents realize the sport was simply a healthy and convenient vehicle through which to raise a family. It was never about winning ribbons, medals and trophies. "The most rewarding aspect has been to watch all of them grow up and become really great individuals," Norm explains.